We could later touch on its history and on why it's called "deep learning" the buzz word - what actually evolved over the recent 20 years. In the end I hope we could start to imagine or forecast a bit real use cases for it, since we have HealthShare along with us. set up a new Jupyter kernel for our tensorflow-gpu environment. define, train, and validate(test) a Keras MLP model with standard MNIST samples, like everyone else in ANN community. briefly talk its key parameters - only a few of them, fairly simple. briefly inspect the demo data - understanding the data is always the key in each and every experiment. demo how easy it is to save some data sample into Cache / HealthShare, and to read it back for prediction (classification), and its implications. Then we may rotate some test samples a bit to see how much we could confuse our trained model - then we may see its apparent limits. We will skip the academic and mathematical part of it, but we might briefly talk into how it works. 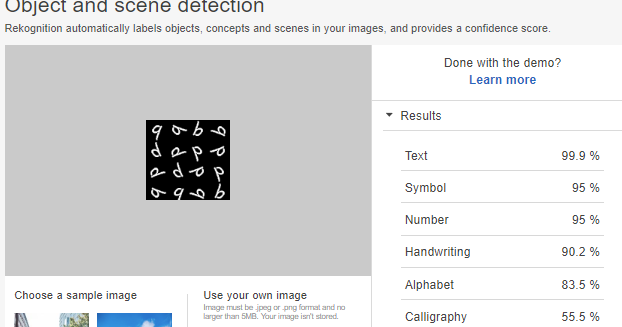 Disclaimer: MNIST data sample is publicly available for this demo purpose. Most demo code were cut to minimum and bare without error handling - all rely on the underlining components. The sources of the Keras codes will be listed in Acknowledgement. The content will be revised anytime as needed. There is no prerequisite for the following experiments other than you need to set up the demo environment as listed in previous "Part I" article. I ran the following commands in my previously installed "tensorflow-gpu" environment. (tensorflow-gpu) C:\>python -m ipykernel install --user --name tensorflow-gpu --display-name "Tensorflow-GPU"
By doing so I created a new Jupyter kernel called e.g. "Tensorflow-GPU". [I 10:58:12.734 NotebookApp] Use Control-C to stop this server and shut down all kernels (twice to skip confirmation). You will see its browser UI is started as below. If you click New... then open a new tab of "Tensorflow_GPU". Let's try a standard deep learning MLP model demo. 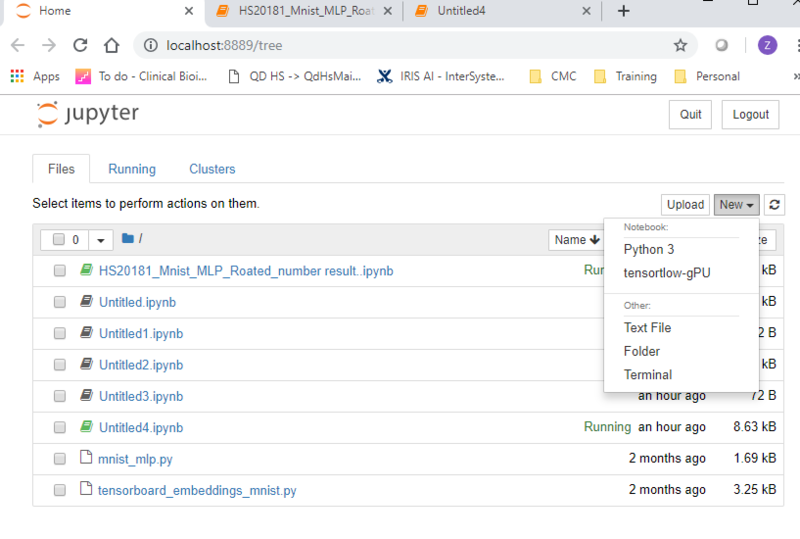 Rename the Jupyter tab to something like "MLP_Demo_ HS", and test Python in its Cell  by running a line blow, then click "Run"
Run a Python sample program in Cell to test we still can connect into the HealthShare db instance as listed in "Part I" article. Cache server port (default 56778)? MLP network's topology is straightforward, as shown below. It normally has 1x input and 1x output layer, and has a number of hidden layers. Each layer has a number of neurons (nodes). Each neuron has an activation function. There can be fully meshed connections (called "Dense" model) between neurons on 2 different layers, as below. Correspondingly, the Keras MLP model we are testing below will have e.g. 2x hidden layers, each having 512x nodes. That's the key topology of this demo model. We will skip other details for now and go to have a run with it. epochs = 20 # run the set of samples 20 times. Note: if there are issues then follow the exception (more likely can't find a package etc), search Google for answers (99% chance you will get the answer), or post your question below. 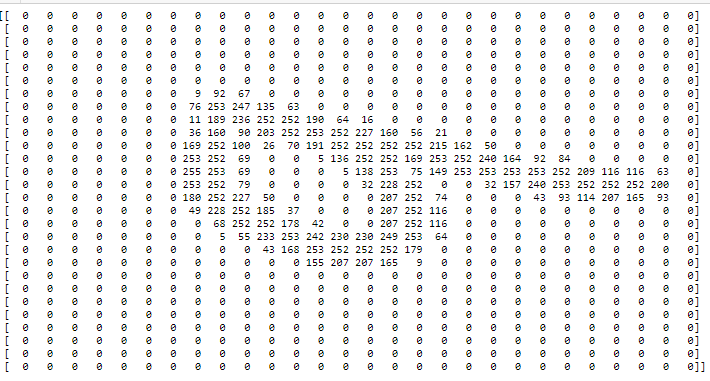 The last line of code loaded the whole date set of 60,000 and 10,000 into a Python array of 3-dimension integers. Let's load one of the training sample into HealthShare database to have a look. 5.5 Load a data sample into HealthShare globals. It will take an input training sample as a string into a global ^XTrainInput, and will save the input training target into ^YTrainTarget. 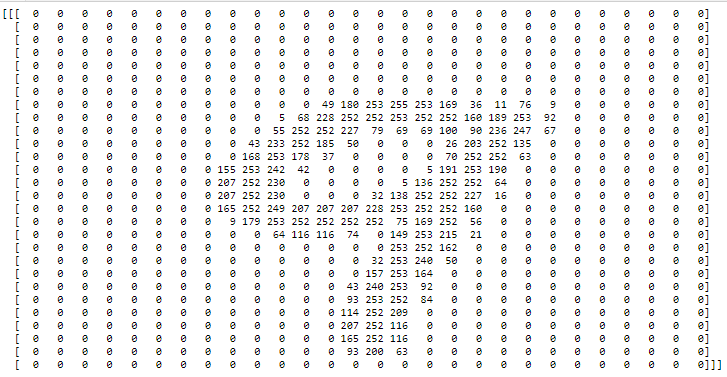 On HealthShare -> Samples, you will see a global called ^XTrainGlobal(0, 2) was created with a string of 2D integers. Later we can do another simple method to read the data back into a Python variable as a sample. Let's finish off the MLP model definition and training in Jupyter. 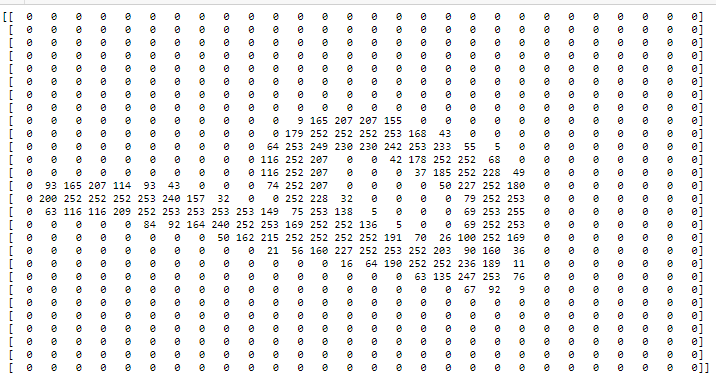 Basically the code below, "reshape" just converts each 28 x 28 sample into a line of 1x 784 values, each between 0 and 255, then it is normalised to float type between 0 and 1.0. Code between Model.Sequential and Model.Summary is to define a MLP of 784 x 512 x 512 x 10 nodes, with a "relu" activation function. Finally model.fit to train it and model.evalute to assess the test result. That's all - now it's "trained". Only a few line of codes, this Keras deep learning MLP runs fairly efficiently on our "tensorflow-gpu" environment. It validates all of our kit installation so far. 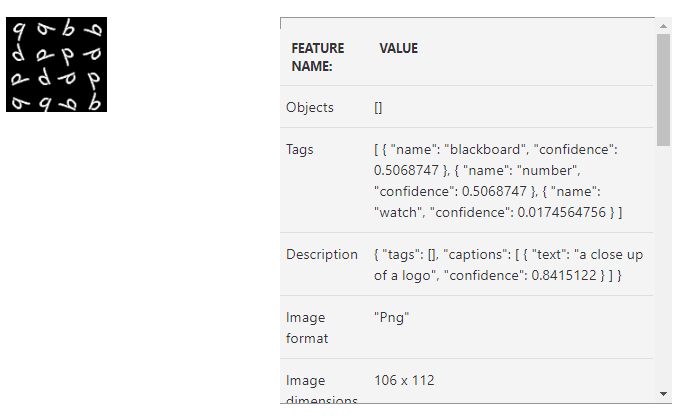 Let's test the trained model with a specified sample below. 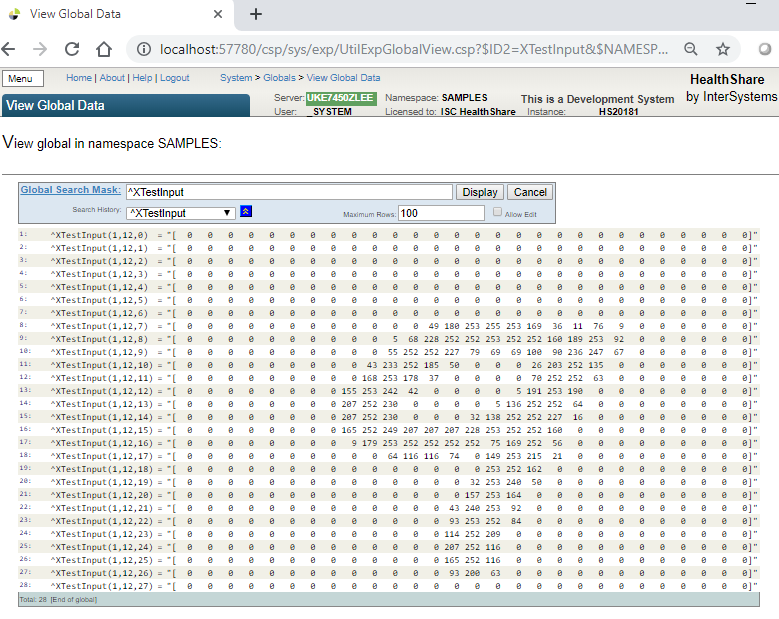 We will randomly select a specific sample out of the 10,000 x_test set, and save it into another HealthShare global, then read it back out of the global into a Python array as a demo sample. We will test the trained model with it. Then we will rotate this input sample 90, 180 and 270 degrees, and re-test our model , to see whether we would confuse it . We can certainly read the sample out of a HS database global. Result12 = model.predict_classes(Sample12f) #test the sample, the result is a clasified lable. The result indicated that the neuron #9 on the output layer has the maximum value of "1.0", so the classification result is "9". It's a correct result. 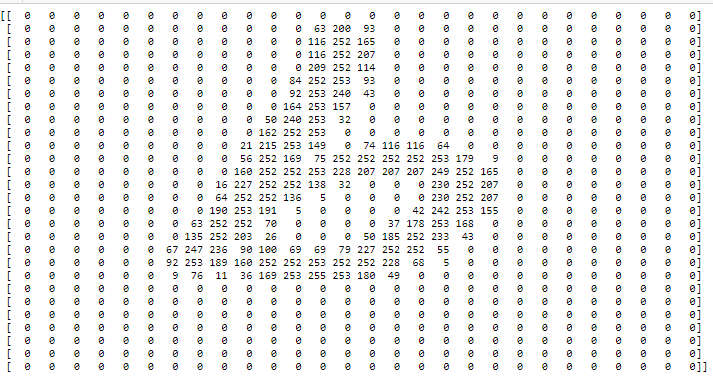 We can certainly send any man-made sample(s) of 28 x 28 integers into the model to have a try. 6.4 Rotate our sample to re-test our model? How about this - could we rotate this sample 90 degree anticlockwise to have another try? Ok, now our model believes it's a "5" - neuron #5 was triggered with the maximum output value. It's slightly confused! (Can be pardoned since it does look like a 5 in its up-right part). Let's turn our sample again to 180 degree - what would our model think? No mistake, of course it's identified to a "6"! We human will tell it as a "6" instead of "9". Apparently, it's confused again - it is recognised to be a "4"
6.5 Compared with public cloud tools? 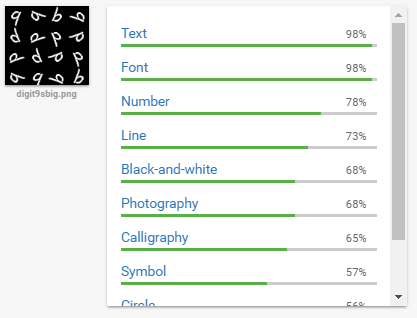 Now I upload it separately into "Google Vision API", "Amazon Rekognition", and "Microsoft Computer Vision API", what would be the results? Well, it seems that AWS has the slightly best score of 95% on "number" in this case (this is certainly not meant to be a representative result). 7 How MLP works in a nutshell? 8 Limits and possible use cases?